If dinner and a movie appeals to you in the form of food and entertainment, then you won’t want to miss Woodstock’s Brown Bag Concert Series. Food will come in the form you provide. Perhaps your own brown bag lunch, picnic basket, or from a local downtown restaurant. Entertainment is provided by a fantastic line up of artists. 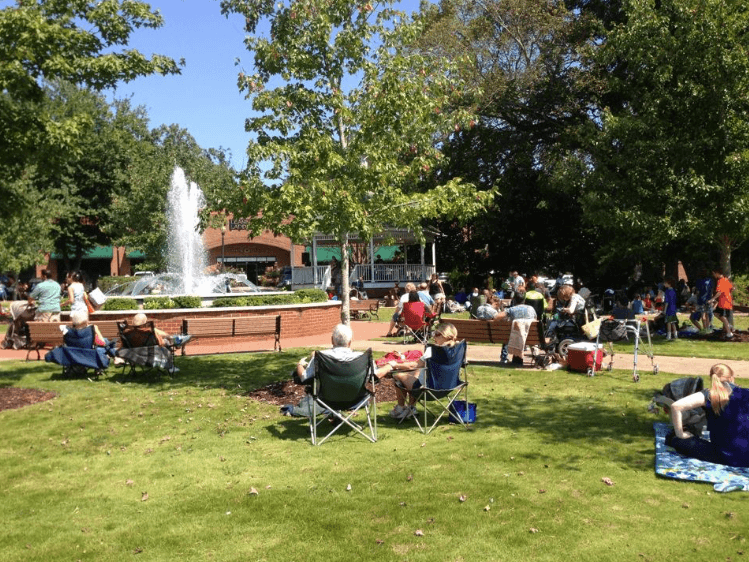 Each week, this free concert is provided in the intimate venue of the Park at City Center surrounding the gazebo stage. Toddlers and little ones play tag and frisbee; adults sit back and relax in a lawn chair or on a picnic blanket and enjoy the tunes. The fourth and final Brown Bag Concert takes place the same week that the Fall Break is scheduled for the Cherokee County School District. Undoubtedly, parents and students alike will take advantage of this concert opportunity in order to make the most out of a stay-cation. It is important to arrive early to the Brown Bag Concert series for parking and sitting space. And of course it wouldn’t be a Brown Bag Concert series without those brown bags, so don’t forget your lunch!